As I said in the previous blog post, I’ve stopped watching Have I Got News For You, because I’m sick of its bias. This is partly because I’m fed up with the show constantly repeating the anti-Corbyn, anti-Labour line of the mainstream newspapers. I also think its because, after having read some of the alternative news outlets and organisations about various issues, like Counterpunch, Lobster and seen Abby Martin and Amy Goodson on RT and Democracy Now, as well as The Young Turks, Secular Talk, the Jimmy Dore Show and Sam Seder’s Majority Report, I’ve become acutely aware of how far the reporting of the corporate media, including the mendacious BBC, is from the real situation in Britain and other nations around the world. I was particularly struck by it during an edition of Have I Got News For You a month or so ago. One of the guests that week is the new head of the Conservative part in Scotland. I can’t remember her name. I did, however, find her very smug, self-satisfied and sneering, as you’d expect from a Tory official. She was also introduced as being ‘openly gay’, as if it were part of the changes the Tories had made to make themselves more electable to the guid people north of the Border. The Tories have been fielding many openly gay candidates around the country for several years now, ever since Dave Cameron took over the party and very ostentatiously set about his modernisation policy. This was about trying to make the Conservatives look more left-wing than the Labour party, then under Tony Blair and Gordon Brown, which wasn’t exactly the most difficult task. Part of this involved them trying to break the image of the ‘nasty party’ by endorsing more female and minority candidates. This is presumably calculated to impress that part of the liberal middle class, who are worried about the lack of representation of women, ethnic minorities and gays in parliament, but only if they come from respectable upper and middle class backgrounds like themselves. If they’re working or lower middle class, then they had better know their place along with the rest of the proles, and not threaten the wonderful Thatcherite utopia the Tories and Blairites have created. At one point, the Tory went off on a rant about how the Ukraine was under threat from Putin, as part of his campaign to annexe the whole country, beginning with the eastern part of the country and the Crimea, before taking over the Sudetenland and invading Poland. The view pushed very much by her was that the Russians are the aggressor, who need to be stopped at all costs from victimising the innocent Ukrainian regime. It’s a tissue of lies. The Ukrainian regime is hardly innocent. It is stuffed full of Nazis from the Pravy Sektor, individuals and organisations that have adopted the full regalia and rituals of the SS auxiliaries that fought for the Nazis during the Second World War. These Ukrainians Nazis fully participated in the Holocaust and were responsible for some of the most horrific pogroms against Jews in the occupied Soviet territories during the War. These groups have shot at and savagely beaten left-wingers, including trade unionists. Just as the regime is intent on clamping down on independent journalists, who do not follow Kyiv’s ultranationalist line. This has included compiling and publishing a black list online of several hundred offending journalist, who have subsequently received death threats. It is also a lie that the current regime is the product of spontaneous democratic demonstrations, like that of the Maidan Revolution. It isn’t. It is essentially the creation of a clique of very corrupt oligarchs, backed by quangos from America and the EU. The orange uniforms the protestors wore were handed out to them at a tent run by these semi-official US organisations. And instead of being the aggressors, it is the Russians and Russian-speaking Ukrainians, who are the victims. Simply looking online, you can find reports of these people being beaten and murdered by the Ukrainian army, and of the Ukrainian government sending troops in to prevent them from reaching polling stations. This is to stop them putting in their votes for the opposition. I realise that some of this is going to be Russian propaganda, but not all. But this is very much not the image presented by the corporate media and the Beeb. Including Private Eye’s editor, Ian Hislop. Hislop cut into the woman’s spiel. However, instead of challenging her about the real situation in Ukraine, he instead decided to ask her questions about whether or not she had contradicted Boris Johnson. This is an issue, especially if you like to see the Tories tear themselves apart. But it’s not the most important issue here. Which is that the British people are being fed lies by their media, and the British, American and EU authorities to whip up hatred of the Russians and strengthen ties with a brutally intolerant and persecutory Nazi regime. There’s obviously a very good reason why the Beeb and the corporate media want to silence any mention of Nazism in Ukraine. Despite the vile antics of National Action, the sight of a real Nazi politico, like those in the Ukrainian rada, in full SS gear, giving the Nazi salute would appal the vast majority of people in this country, regardless of whichever side of the political spectrum they came from. Except, perhaps, the Tory right and parts of UKIP. And so in the interests of furthering this international, corporatist agenda of incorporating the Ukraine into the web of western-orientated, free-trade governed countries, any reporting and discussion of just how murderous and undemocratic the Ukrainian regime is, is rigorously censored. And this incident also showed how the Beeb’s political bias works, even in a show which proclaims itself as ‘irreverent’. In an interview a while ago at the Edinburgh television festival, the genuinely irreverent – amongst many other things – Scots comedian Frankie Boyle discussed political bias at the Beeb. Boyle, you will remember, had been a regular guest on Mock The Week, another news comedy show. This was more like What’s My Line, in that the guests were given subjects to joke about by the question master, Dara O’Brien. Boyle disappeared as some of his jokes were too extreme and dark for the Beeb, even if the show was broadcast after nine O’clock. Boyle commented that the Beeb’s idea of remaining impartial is simply to lampoon all of the parties. It does not, however, like criticism or jokes about particular issues. And so Boyle’s humour was too edgy for the Corporation. He was also critical of Have I Got News For You and the cosy relationship the show has with the politicians it lambasts and lampoons. Boyle had been to Romania. While he was there, he watched a Romanian comedian on television, who was making jokes about the country’s government, members of which were in the audience. The comedian pointed them out, and the politicos and comedian exchanged quips and greetings. Boyle found it all far too cosy and complacent, and said so to his Romanian guide. The man defended the show, saying that Boyle had it in his own country. How so, asked the Scots comedian. ‘I’ve seen it. Have I Got News For You‘, replied his Romanian friend, who stated it was just like that. And Boyle concurs that it is. He stated that if the show rips into a politico one week, the next week they’ll have him on the panel, laughing and joking with them. He gave the example of Boris Johnson, who was a regular guest on the show. He could have mentioned many others. Such as Cecil Parkinson, who father a love child with his secretary, Sarah Keays, and then did his best to prevent the story getting out and imposing legal restrictions on Keays and her disabled daughter that led to great hardship. I have to say, I don’t know many women, who find Parkinson at all attractive. Far from it. I think most women find him smarmy. And my mother and her friends described him as ‘the type of man you would not like to be caught behind the filing cabinet with’. But Parkinson’s charm certainly worked on Hislop. After he appeared on Have I Got News For You, the editor of Private Eye talked about he charmed all of them on the programme. Perhaps you have to meet him in person to feel it. I’m very much aware that Frankie Boyle is very much a controversial figure. Some of his jokes are too dark and tasteless for most people. But in this case, he’s absolutely right. The BBC has a very pronounced bias, even on ‘satirical’ shows such as Have I Got News For You, where the presenters and guests very definitely keep away from certain topics, and keep their criticisms within the very narrow compass prescribed by the official media. Okay, it’s started. Donald Trump has bought $2 million of campaign ads, which he’s screening in Iowa and New Hampshire, two of the most critical states in the presidential primaries. Apparently it was screened over 60 times this week in once of those states already. It sets out Trump’s policies – put a temporary stop to Muslim immigration into the US, build a wall with Mexico, and make the Mexicans pay for it, cut the head off ISIS and take their oil. I know that Trump has already said all of this stuff, but seeing him actually campaign on it on film as a set election pledge makes it all the more chilling. It’s no longer a piece of random rhetoric he’s spouted out at his town hall meetings just to sound good or see which buttons in the American psyche he can press. In this video, The Young Turks analyse the ads, and show up the glaring falsehoods and misrepresentations he makes. Just on a point of imagery, the ad’s offensive as when it mentions his declaration to decapitate ISIS, it goes straight from pictures of Obama and Hillary to the San Bernadino shooters, as if Obama and Mrs Clinton are somehow connected to or responsible for those terrorists. Let’s have no illusion about what Trump is doing here. This isn’t just coincidence. There are Americans, unfortunately, who really do think that Obama is a secret Muslim installed in the White House, who is part of a clandestine Muslim Brotherhood plot to undermine American democracy. There’s a whole conspiracy literature about this on the Counter-Jihad net, if you want to look. And the claims about Mexico are also misleading. For the first time in decades, there is a net loss in the number of Mexicans coming to the US. More Mexicans are leaving than coming to America. And the image Trump uses to illustrate his factoid is also mendacious. This shows crowds of people swarming towards a border post. But the footage isn’t actually from the Mexican border. It’s from Morocco, and was taken by an Italian news agency. Trump got hold of it, removed the identifying marks, and then put it in his ad to mislead the American public. And when he was caught out with the lie, his people simply admitted it, and tried to excuse themselves by saying that they did so to make people think about the scale of immigration, if this was to the US. They’re blatant, and unapologetic about lying. And what is really worrying is the complete silence of American journalism about these lies, with a few honourable exceptions. They just run these ads, and what comment there is, is simply about how effective they are. No critique of the factual content of the ads, or its lies and deceptive imagery. Hispanic immigration to the US has been a highly contentious topic for about three decades now. I can remember in the 1980s the Republicans ran one ad, rhetorically asking Americans what language their children would be learning in the future. It was clearly aimed at stirring up racial fears about being swamped by Spanish-speaking immigrants. It’s hard not to feel sympathy for some of them, at least. Earlier this year, British TV screened a series in which the Irish comedians Dara O’Brien and Ed Byrne travelled from American into Central and South America along the Pan-American Highway, marking the journey made in the 1930s by the American entrepreneur, who created the road, as he set off to interest the American and Central American governments in this venture. O’Brien and Byrne touched on the subject of the migrants heading north when they stopped at a border post next to a railway, full of hopeful emigrants. They stated that these migrants are travelling to avoid terrible war, poverty and persecution in the homelands. They are also desperately vulnerable, literally risking everything to get into the US. O’Brien and Byrne pointed out that the maras, the Latin American gangs, would also get onto the trains and buses, and rob the migrants of everything, including literally the clothes of their backs, leaving them naked and penniless in a foreign country. Always assuming, they didn’t simply kill them. If the US wanted to do something about the mass immigration from the south, then it could start by tackling some of the causes. Many, perhaps most, of South and Central Americas problems are beyond direct American control, but US diplomacy certainly hasn’t helped. From the 1950s to the ’70s and ’80s America overthrow genuinely progressive regimes in Guatemala, Chile and Brazil, backing a string of Right-wing dictators and guerrilla movements in Nicaragua and El Salvador in order to protect American business interests and stop the spread of Communism. Well, that’s how it was sold to the American public. Except that the Brazilian regime they overthrew was actually Liberal, and Benz’s government in Guatemala was democratic Socialist. After Benz was overthrown, the CIA carefully arranged a photoshoot with American journalists and politicians, including Richard Nixon, in which they displayed the Communist literature they’d carefully planted around Benz’s office. And the North American Free Trade Agreement (NAFTA), which Mexico joined, along with Canada, has also harmed the Mexican economy. Lobster has stated that about 200,000 or so Mexican jobs have been lost through the deal. Over the border in the North, jobs have also been lost in the US, as manufacturers and firms have moved south to take advantage of cheap labour. So both sides have actually lost. But everything’s okay, as for the first time Coca-Cola has managed to make inroads into the land of the Aztecs. Before then, Mexico was one of the few places on Earth, where Coca-Cola didn’t sell. The Mexicans preferred their own soft drink, a kind of fizzy apple juice. America could therefore do much to help cut down on immigration to the US by sponsoring genuinely democratic governments devoted social justice and raising their people’s quality of life and standard of living. But this would mean radically altering the whole orientation of American politics away from laissez-faire individualism and government for the benefit of the corporations rather than the citizens. It’s what Bernie Sanders, one of the Democrat contenders, would like to do. It’s also what the right-wing of the Democrats and the Republican party as a whole hate and fear. Promoting genuine prosperity abroad and at home doesn’t sell well to the American public, it seems. Too wishy-washy liberal. Best to just show images of rampaging immigrants and terrorists and clamp down on immigrants, while doing nothing about the causes pushing them north and west into America. BBC 4 a few weeks ago broadcast a documentary on the history of Jodrell Bank, Britain’s pioneering radio telescope. Bernard Lovell, its founder and director, had been one of the scientists working on the development of radar during the War, and the radio telescope was originally built using parts left over from the project that were due to be scrapped. In the early days it was very much an ad hoc operation. The size of the telescope’s dish has the radius it has because that was the distance between the van holding its key components in the early days to the edge of the field. The programme covered the history of the telescope from its very beginnings to today. It described how the telescope came into its own in the late 1950s and 1960s when it was the only instrument that could independently verify the first Soviet space missions and their conquest of space. This also caused additional pressure on Lovell, as there was official demand for him to monitor space missions in the USSR, which detracted from his real interest in exploring the heavens through the radio signals sent out into space from stars, nebulae and galaxies. The Russians also liked and admired Lovell, so much so that on scientific trip to the Soviet Union, the Russians showed him some of their highly top secret space installations, and hinted that he would be very welcome if he left Britain and joined them. Obviously the great man did not take up the offer. Eventually such pressure proved so great that he was off work suffering from depression, and even considered leaving science altogether. Lovell was a Methodist, and to the surprise of his children, at this point in his career he considered joining the clergy. He didn’t, but went back to charting the heavens. Other highlights of the telescope’s fifty-odd year history was the discovery, by Jocelyn Bell-Purnell, of pulsars. These are neutron stars, small, highly compact stars at the end of their lives, which broadcast a signal into space. The stars are small, about 40 miles or so in diameter, and spin quickly, so it appears that the signal is being sent in pulses. They’re also regular, so that in the first few days when they were discovered one of the theories about them was that they were a signal deliberately sent out into space from an extraterrestrial civilisation. After more pulsars were discovered in the following days, the scientists were able to give the true explanation of their origins. Since its heyday, much larger telescopes and arrays have been built. Jodrell Bank nevertheless still remains important, contributing valuable research in this area of astronomy. Indeed. I remember a few years ago an edition of one of the Beeb’s astronomy programmes in which Dara O’Brien and Brian May were up there. O’Brien is a failed mathematician, having dropped out of a university maths course, while May is a properly accredited astrophysicist. He had, it’s true, a twenty-odd year gap in his career, due to performing with Queen, but he finally handed his thesis in a few years ago. It was duly marked, and he passed. This obviously makes him one of the most rock ‘n’ roll scientists ever. I think in the programme they were supposed to be looking for signals from alien civilisations. They didn’t find any, which probably surprised no one, given that scientists have been looking, off and on, for radio signals from aliens since the days of Project OZMA in the late ’60s and 70s. Despite NASA’s optimistic prediction in 1995 that in five years they would be discovered, no has as yet. Patrick Moore, one of the greatest science communicators and popularisers, always maintained that astronomy was still one of the very few areas of science where amateurs using modest equipment could make a real contribution. I doubt that there are very many ordinary people outside the big observatories, who have an active interest in radio telescopy. Nevertheless, it is possible to build your own radio telescopes. 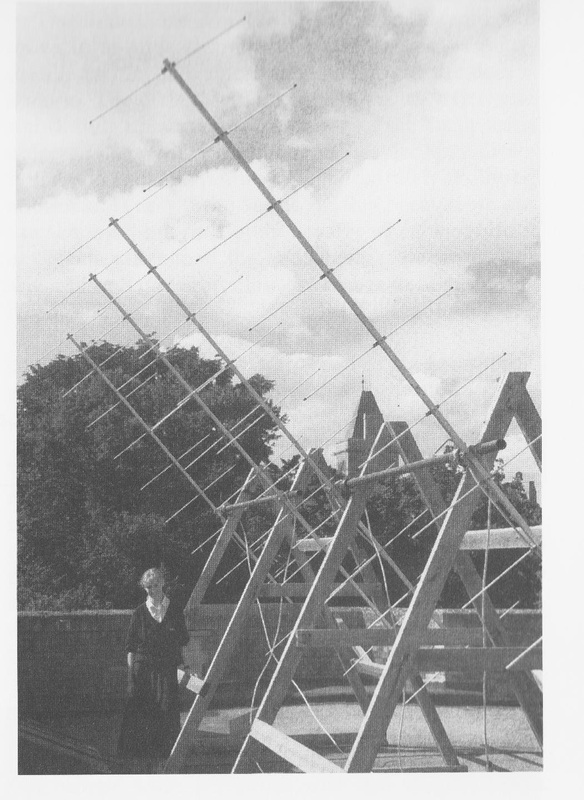 There’s a piece by Trevor Hill, who was a science teacher at Taunton School in Somerset, about how he built a an array of radio telescopes in the book, Small Astronomical Observatories, edited by Patrick Moore (London: Springer 1986). He did so as part of an attempt to get the pupils interested in astronomy. Naturally, he started off by building a normal, optical observatory for a telescope. He turned to radio astronomy at the suggestion of one of the pupils after the normal astronomy session had been cancelled due to rain. The pupil pointed out that radio waves travel through clouds, and so observation wouldn’t be stopped by bad weather. His article in the book describes the radio telescopes he built. This includes a set of Ham radio aerials set up in an array to receive radio waves from solar flares. He also provides a schematic of the telescope’s construction. As you can see from the photo, even as a small-scale amateur project it’s still very large. Nevertheless, he states that it was very cheap. With the exception of the computer, it cost about £200 in 1995. Which means it’s almost possible for every man or woman to become their own radio astronomer. Obviously, this was before the boom ended, and Cameron got in to hit everyone with massive debt and advancing poverty. Here’s Tim O’Brien, professor of astrophysics at Manchester University and the radio telescope’s associate director, talking about the telescope on the 70s anniversary of its establishment. It’s great to hear him say that it remains at the cutting edge of research, and may be so for the next fifty years.